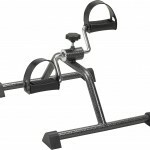 Instead of having a bulky exercise bike, pedal exercisers can be used from the comfort of any chair. They can be used to work the upper as well as the lower body. They can help increase the amount of blood flow to the extremities.